Today is Remembrance Day in Canada. It is a day for remembering war and working for peace. It is 100 years since the First World War started and some of the women contributing recipes to the 1898 New Galt Cook Book lost family to that war to end all wars. Some women went off to war as doctors and nurses. They would have grown up with recipes like Wine Soup (For Invalids) from the Cookery for the Sick section of the cookbook. The recipe was contributed by Mrs. Richard Strong. I put 1 tablespoon of flour in a saucepan. I added 4 egg yolks and tried to figure out the size of a small nut. What sort of nut. I finally decided to use 1 teaspoon of butter. I put cinnamon on the end of dinner knife and added it too. I zested a lemon and added it to the pan. I pulled a leftover bottle of white wine from the fridge and added 1 pint (2 cups) to the saucepan. I decided to add just a bit of sugar. I stirred and turned on the heat low at first. As the butter melted I kept stirring to try to prevent the flour from lumping and the egg from curdling. I gradually turned up the heat and the liquid started to thicken. I made sure it didn’t boil especially as I noticed my egg was starting to scramble. I pulled the pot from the stove. While it had been cooking I cut a slice of my brown bread from a few days ago and made dice sized cubes. I put them in a plain soup bowl and then poured some wine soup over top. It was time to taste. This is the sort of food used to “build up” a patient. It has eggs and butter and sugar to add calories and even the wine would be considered helpful. I thought the egg yolks might be excessive but that’s because I don’t like them. I didn’t notice the taste since the flavour of the wine was strong enough to cover up the egg. The lemon and cinnamon were nice but I might add a bit more. The soup went well with my brown bread and although I wouldn’t want to eat this as a regular soup, it would be okay if I was sick. One tablespoonful flour, yelks of four eggs, the grated peel of a lemon, as much cinnamon as will lay on the point of a knife, a piece of butter the size of a small nut, one pint of wine, sugar to taste. Mix all well together and put on the stove, stirring until it thickens but not boil. Have ready some small dice-shaped pieces of bread, and pour the mixture over it. Light colored wine is the best to use. Health care has changed and improved in many ways. My mother is currently in hospital experiencing all sorts of innovations that would not have been available in 1898. In Galt Ontario in 1898 people could receive care in the Galt Hospital but families also provided home care for long lasting diseases like tuberculosis or for minor illnesses and injuries. Cookbooks like The New Galt Cook Book (1898) include chapters called Cookery for the Sick. I thought I’d try another of these recipes tonight while I’m healthy enough to make it since some are time consuming and sort of gross. This time it is one called Scraped Beef contributed by Miss Wardlaw. The first step was to take a piece of steak and scrape it. For some reason I find it hard to figure out the grain of meat but I gave it my best shot. I used a knife and scraped just enough (about 1 tablespoon) meat to make one patty since this recipe really doesn’t sound appealing to me. I got the frying pan hot and put a bit of butter in it and then shaped my beef “pulp” into a thin patty about the size of a toonie. I put it in the pan and fried it on one side and then turned it. I don’t like rare beef so I probably cooked it a bit longer than Miss Wardlaw intended. I’m glad I was allowed to season my patty with salt and pepper before tasting. I suspect this sort of food was intended to help build up the patient — perhaps helping rebuild their stores of iron (something I need too). Blood transfusions really didn’t exist at this time. Part of the difficulty was the lack of blood typing. Many medical innovations occurred during the horrors of the First World War out of desperation. Here’s a link to general information about this idea and be warned some of the descriptions are very vivid. Miss Wardlaw contributed a number of sick room recipes to this cook book but she also shared other recipes. I talked about Margaret “Maggie” Janet Wardlaw extensively on Day 281 when I made her Pickled Onions recipe. She was a nurse at the Galt Hospital and would have been very familiar with recipes like Scraped Beef. Scraped Beef is a surprise. This is good! I wish I’d made another patty. Although this is basically ground beef the texture is much finer. There were no hard bits or strange stringy things which make eating ground beef an adventure for me. I have to set aside my imagination and just eat. However, a scraped beef patty is soft and tastes really good even before the salt and pepper. Take a piece of beefsteak and scrape against the grain, form this pulp into rather thin patties. Have the frying-pan hot with a very small piece of butter in it just enough to keep the meat from sticking. Put in the meat, brown nicely, but do not have it overdone. Season with pepper and salt after removing from the fire and serve immediately. I started to type the title of this recipe as Whine Way rather than Wine Whey. The first version is a better reflection of how much whining I’ve been doing about this cough that won’t go away. It is a daily reminder of the summer cold I had a few weeks ago and I can’t seem to get rid of it. I thought this drink or food might soothe my throat or at least make me not notice it as much. The recipe contributed by Miss Wardlaw appears in the Cookery for the Sick section of the 1898 New Galt Cook Book. I recently discovered milk in glass bottles at my grocery store. I bought some just to see what it would be like and thought it might be good in this recipe. I put 1/2 pint (1 cup) of milk in a small saucepan on the stove and turned on the heat. I had to hunt for a bottle of sherry in the house for this recipe. I keep some around for cooking and usually buy Harvey’s Bristol Cream out of nostalgia. The very first time I tasted it I was being polite while visiting some elderly relatives in Wales. They were distantly related but so welcoming I couldn’t refuse to try their beverage of choice. I checked the Harvey’s website and this drink was around in 1898. In fact they had recently received a royal warrant from Queen Victoria so using Harvey’s Bristol Cream seems appropriate for this recipe. I poured some sherry into a small wineglass and poured it into the pot when the milk was just starting to boil. I stirred and it started to curd immediately so I took the pan from the heat. I continued to stir until the curds and whey seemed completely separated. I wasn’t sure whether it was the curd or the whey I was to consume so I kept both when I strained my mixture. This type of sherry is quite sweet so I wanted to taste both items before adding any sugar. I decided to start with the curds. Adding an acid like lemon juice, vinegar, rennet or sherry to milk or cream causes it to separate into curds and whey. Usually it is the curds that are used to make cheese or just a simple cottage cheese. I’ve made that sort of cottage cheese a number of times with vinegar and really like it. I’ve never tried it with sherry. The curds were an unappetizing grey brown colour but they tasted okay — just a bit sweet. I wasn’t sure what to expect with the whey but suspected that it is what I was really supposed to consume. I gathered a bit of bravery and prepared to taste Wine Whey. Miss Wardlaw is Margaret “Maggie” Jane Wardlaw. I’ve written about her a couple of times since she contributed a number of recipes for the sick room. That’s not surprising since she was a trained nurse. Wine Whey is really good — well if you don’t mind cream sherry. It’s not as strong as sherry on its own and drinking it hot was wonderfully comforting. I suspect I will sleep well tonight. I’m not sure I’d like it as much if I’d made it with lemon or vinegar. I’ve been trying to figure out why this would be served to a sick person but think it could be a way to provide some of the healthful qualities of milk without the part that contributes to congestion or can be difficult to digest. I’m sensitive to the protein in milk but feel that wine whey might be okay. Heat half a pint of milk to the boiling point and pour into it a wineglassful of sherry; stir these; as soon as the curd separates remove from the fire and strain. Sweeten if desired. The whey can be similarly separated by lemon juice, vinegar or rennet. With rennet whey use salt instead of sugar. Today the summer weather turned a bit chilly so the cough from my summer cold is annoying me even more. I’ve had it for a week so I’m now going to try one of the remedies in The New Galt Cook Book (1898). There are two recipes for Cough Mixture but I’m going to try the one contributed by Mrs. Hume since it has the caption “Good”. I can’t make either of the recipe completely accurately since they both contain laudanum — a preparation containing opium. The other difficulty with these recipes is the measurements. They are based on the cost of the ingredients. 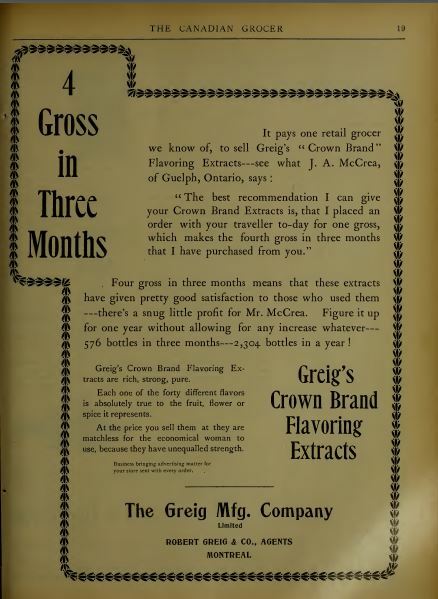 I’m going to do my best using information in The Canadian Grocer magazine, other recipes, and common sense. I’m also going to cut this recipe in half. Another challenge is determining what sort of syrup is intended in this recipe. Is it maple syrup or corn syrup or a home made syrup of sugar and water? I’m going to use corn syrup since I have it on hand but I think maple syrup would be more likely for Mrs. Hume simply because of her age. At this point I decided I should cut this recipe even further. I’m cutting my half recipe into one quarter! Therefore I put 1/4 cup corn syrup into a glass. Next I added 1 teaspoon anise seed. Is the peppermint dried leaves or extract? I’m going to assume that it is peppermint oil. I added 1 capful of peppermint extract. Finally I added 1/4 cup of hot water. I stirred well. The fragrance of the peppermint was immediately obvious. I considered adding some aspirin as the closest thing to the painkilling effect of laudanum but decided to hold off and just sample the combination I had created thus far. I think Mrs. Hume is probably Ann Ingles since her daughter Annie is also a recipe contributor. Ann Ingles was born in Scotland in 1831 and must have come to Canada sometime before 1851 since she married Gavin Hume in Galt Ontario in 1852. Gavin was also from Scotland and was a hardware and grocery merchant. They had approximately eleven children and remarkably all but one lived to adulthood. Little James died when he was 1 year 7 months old in 1868. Several were in their nineties when they died. Ann was a new widow when her recipe appeared in the cook book. She died in 1905 of stomach cancer while living in Toronto. For some reason she and several of the younger children had moved there between Gavin’s death in 1895 and the 1901 census. I sampled my cough mixture while it was hot to enjoy any soothing effect as soon as possible. Wow! This tastes like the cough medicine of my childhood! The peppermint immediately cleared my nose. The syrup coated my throat. The heat felt soothing and the anise seed gave it a medicinal flavour. According to this website, anise seed has long been used in cough remedies and it is now know it contains creosol and alpha-pinen which help loosen secretions. After a couple of sips (about two teaspoons) I found it effective. I imagine the laudanum would ease any pain associated with the cough and induce sleep but it works fine without it. I wonder how many of the children were give this during the usual childhood illnesses. Three cents’ worth of anise seed, three cents’ worth of peppermint, three cents’ worth of laudanum, one pint of syrup and one pint of hot water, mix all together. I’m still not feeling great so I’m going to make something that sounds easy to make and to eat. It’s Arrowroot Pudding using the recipe Miss Wardlaw contributed to the 1898 New Galt Cook Book. I’m using the arrowroot powder I bought a number of months ago when it was still winter. According to The Canadian Grocer magazine in 1898, arrowroot was coming from Bermuda and St. Vincent in the Caribbean. I put a tablespoon (2 teaspoons) of the powdered arrowroot in a bowl with 1 dessertspoon (2 teaspoons) of sugar and then added 1 tablespoon of milk. I put the 1/2 pint (1 cup) minus a tablespoon of milk in a saucepan and cut the peel from a lemon and put the rind in with the milk. I boiled the milk and once it was boiled I took out the lemon rind and added some nutmeg. Then I poured the lemon flavoured milk over the arrowroot mixture. I stirred well and left it to cool a bit. Meanwhile I separated 2 eggs. I beat the yolks and added them to the cooled milk mixture. I whipped the egg whites and then folded them into the rest. I poured this into a greased baking dish and put it in the preheated 350 F. oven. I pulled it out after 10 minutes. I wasn’t sure if I was to eat it hot or cold so I’m trying it both ways. Miss Wardlaw is a somewhat familiar contributor of recipes in this cook book. She’s one of the main women sharing recipes suitable for serving to patients. Margaret “Maggie” Janet Wardlaw was born to Mary Ann Davidson and John Wardlaw in 1861 probably in Oxford county as her family shows up in the 1861 census there. Maggie was likely named for her father’s sister who lived with them later in her life. Her parents were born in Scotland but were in Canada by the time Maggie was born. Her father was a woollen manufacturer and her eldest brother was already an engineer in 1871. Her next oldest brother became a doctor and in the 1891 census her younger brother is a dentist and Maggie is a nurse in the hospital. By 1901 she is living with her widowed doctor brother and is no longer listed as a nurse. They appear in the 1902 booklet about Galt Collegiate and she’s listed as a 1876 graduate and a resident of Galt. She lived in Galt until her parents’ deaths in the early 20th century but I’m not sure what she did afterwards. Her brother had remarried by then. She died in Newmarket Ontario in 1931 and since her brother is the informant on her death certificate I’m assuming she lived with him at least in her later years. As far as I can tell she never married. 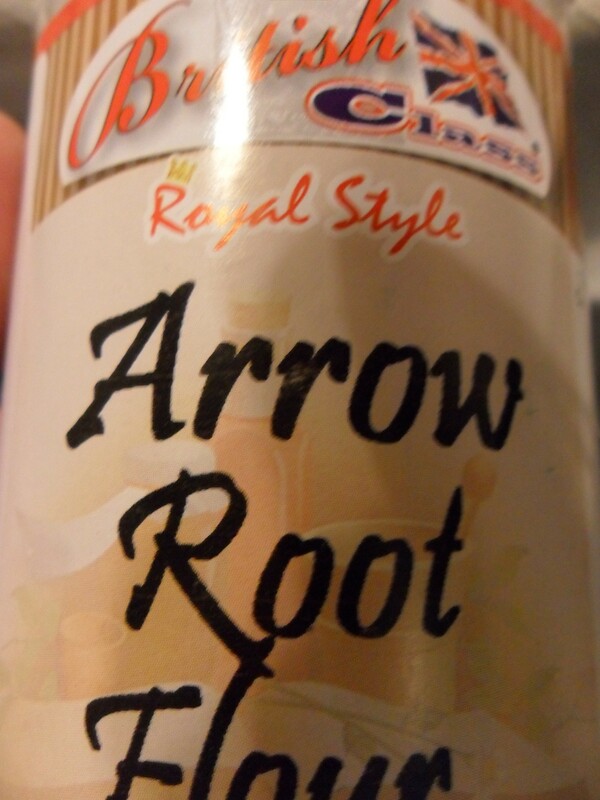 Arrowroot Pudding tastes pretty good, at least it is better than I expected. The lemon and nutmeg flavour is very nice and it isn’t too sweet. Initially it was quite liquid with a slightly crispy almost meringue top. Later as it cooled it still didn’t set up as much as I’d hoped. The arrowroot seemed to be on the bottom, the milky liquid in the middle, and the egg white on the top. I’m not sure what I did wrong (if anything) but I think it might be worth another shot sometime. Perhaps it will set up overnight like the blancmange a week ago. I’ve heard of infusing with vanilla bean but not lemon rind. I think this is at least the second time I’ve had to use the lemon rind in milk technique and I really like it. It adds something special to the milk used in desserts and it’s something I’d like to take into my modern cooking. One tablespoonful arrowroot, half pint milk, two eggs, one dessertspoonful sugar, a little nutmeg and lemon rind. First mix the arrowroot and sugar with one tablespoonful of milk. Boil the rest of the milk with the lemon rind (when the milk boils remove the rind), pour the boiling milk over the arrowroot. When slightly cool add the well beaten yelks of the eggs and mix thoroughly. Beat the whites of the eggs to a stiff froth, add as lightly as possible to the mixture and bake in the oven for ten minutes. I’m not feeling great so I’m going to try another of the Cookery for the Sick recipes in The New Galt Cook Book (1898). 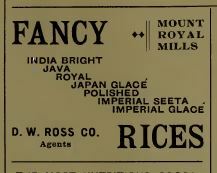 This one is Rice Jelly for Invalids from the mysterious S.B.C. I put 1/4 pound (1/2 cup) of rice in a small saucepan and then added 1/2 pound (1 cup) of sugar. After stirring I added just enough water to cover it and put it on to boil. I soon started to wonder if I had made a mistake. The sugar started to turn to candy long before the rice could be cooked. I added more water but still ended up with some “toasted” rice. I have heard that some of you enjoy reading about the disastrous recipes. Well, this one qualifies. This is not what is meant by sticky rice! It was a mess. So, what went wrong? Did I misread the recipe? Maybe. Should I have covered the pot? Probably. Should I cook the rice significantly more before adding the sugar? Perhaps. Would starting with more water help? Likely. Should I start over tonight? Not a chance. I’m too tired and after all I was making it because I didn’t feel well. Sorting out the options to try again will have to wait for another day. Carefully look over and wash one-quarter pound of rice, put one-half pound of fine sugar with it, and set on stove with just enough water to cover; boil it until it becomes a glutinous mass, then strain it, add a little salt flavor with any flavor you choose — lemon is nice — let it stand until cool. The family I discovered via yesterday’s recipe in The New Galt Cook Book (1898) must have been familiar with Cookery for the Sick since two members died of tuberculosis and another died from pneumonia. It is likely that various remedies were tried and that they consumed a variety of sickroom food. I have two family members who will have surgery in the next few days. One will require liquids for a few days so I’m going to try Miss Wardlaw‘s recipe for Lemon Egg-Nog tonight as practice. I beat up a medium egg in a glass and squeezed in the juice of a lemon. I added a pinch of salt and a teaspoon of sugar. Once everything was well mixed I poured in the milk. I took a quick sip and adjusted the sugar before sitting down with my nourishing liquid. Miss Wardlaw is a trained nurse so she contributed a large number of recipes to the chapter on cookery for the sick. She was born Margaret Janet Wardlaw in Galt Ontario in 1862 but was known as Maggie when she was young. Her parents John and Mary Ann had emigrated from Scotland with her eldest brother. Maggie and two more boys were born in Ontario where John was a woolen manufacturer. Maggie’s eldest brother became a doctor, another was a dentist, and she was a nurse in a hospital. She eventually gave up nursing at the hospital and ended up living with one of her brothers. She died in 1931. This beverage combines two problem foods for me — eggs which I despise and milk which I shouldn’t consume — and yet lemon egg nog isn’t too bad. I recommend beating the egg very thoroughly as my first taste included a stringy slimy slurp of egg white along with the other flavours. Once it was blended better it had an interesting taste. I finally decided it tasted a bit like a lemon ice cream, probably because of the lemon and cold milk. I kept mine a bit tart but you can use as much or as little sugar as necessary. These days using a raw egg is an issue. You could try making this recipe using some of the pasteurized eggs that come in a carton like milk. I’d suggest making lemon egg nog if you are adventurous and like these ingredients. It really is a refreshing drink. Beat up an egg, add sugar to taste, also a pinch of salt, squeeze the juice of a lemon. Fill up the glass with very good milk.